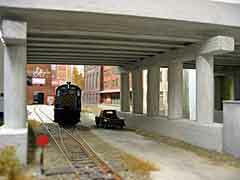 The 27th annual National Narrow Gauge Convention concluded on 1 September 2007 in Portland, Maine. This year there was a competition for “mini layouts.” Although over-all participation was disappointing, we’re happy to report that all five mini layout entries were built by past contributors to this website! They were photographed by John Hubbard, from Huntsville, Alabama, acting as this site’s Official Photog for Eastern North America (OPENA). 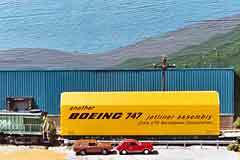 John’s photos, shown here, illustrate all five entries including three from a single modeller, Charles Hansen, who lives in Boston, Massachusetts. 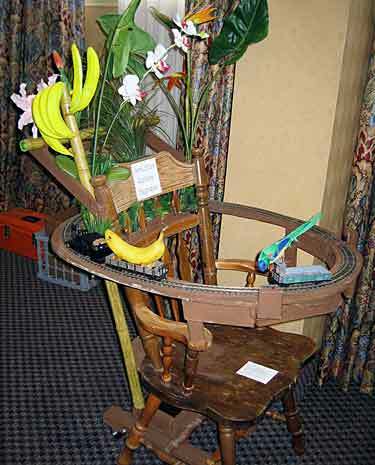 Charles’s displays are shown above, clockwise from left: the original Armchair railroad, which feeds and is operated by a seated armchair railroader; the V-skip railway, consisting of skips and track lengths in a variety of scales and sizes; and a garden pizza line with live plants, built in a recycled kitty litter pan. 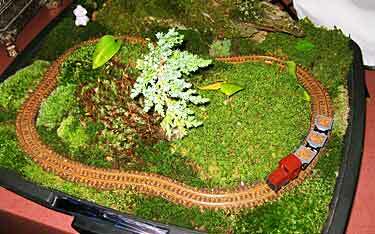 The garden layout won the competition. Below are two excellent layouts exhibited by other contributors to this site: at left is Dijkman Klompen-Atelier, John Hubbard’s HOn30 shoebox layout showing Dutch wooden shoe works beside an Amsterdam canal (described in Scrapbook #65 earlier this month); at right is Boat Brothers Watercress, a new Gn15 layout by Christopher Creighton, from Schomberg, Ontario, Canada, the presiding genius at Schomberg Scale Models. It features some remarkable scenic work. One of the best designs for good operation in a minimum space is the “Two-Turnout Theme” illustrated in Scrapbook #59a. 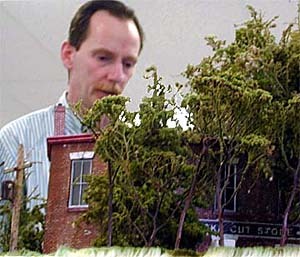 On that page Bill Corser’s Baigent Yard (at right) illustrates the idea, packing a 1:19 scale railroad (16mm to the foot on 32mm gauge) into a space 30x10in (75x25cm). Here are some more of these operations-oriented layouts. 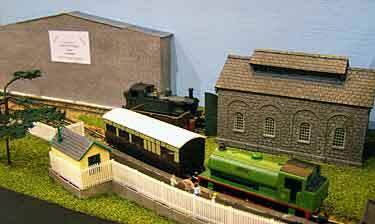 Kieron Thexton, from Barrow in Furness, Cumbria, England, decided to use the Two-Turnout Theme in order to get maximum operation for his tiny N-scale shelf layout. Measuring just 20½x7½in (52x19cm), Clacnes Holiday Camp depicts an internal railway system at a large resort in the South West of England in the 1960s, when their popularity was at its peak. 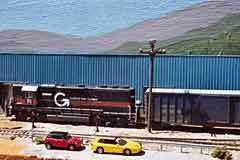 Rather than use the improbable roads in the area to transport supplies, the holiday company invested in a rail link to the main BR line at Clacness Town station. Note that the fiddle yard is contained entirely on the baseboard, a desireable design feature for this designer. 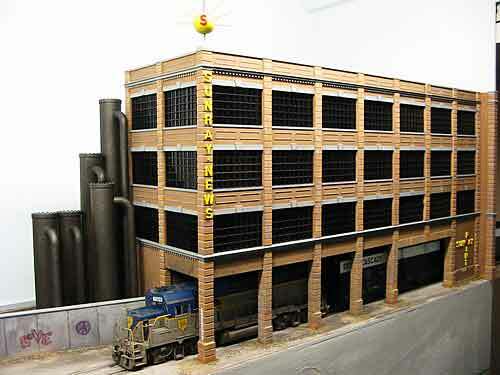 Both the stores building and the low-relief warehouse were scanned from OO originals and reduced in size on a computer, then printed out as N scale kits. Both, Kieron notes, are temporary placeholders until scratchbuilt structures are completed. 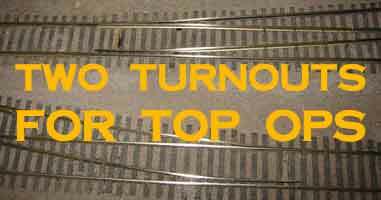 The little switching line was directly inspired by this website, specifically by Ian Bareham’s St. Augustine’s Hospital Railway (a classic use of the two-turnout theme!). The locale can be in the U.S. or, with slight scenic changes, almost anywhere else in the world. Wherever it may be, there’s plenty of switching to do on this busy little line! Millwall Quay reductio (almost) ad absurdum is a drastic simplification of Giles’s Millwall Quay plan published in Railway Modeller magazine. 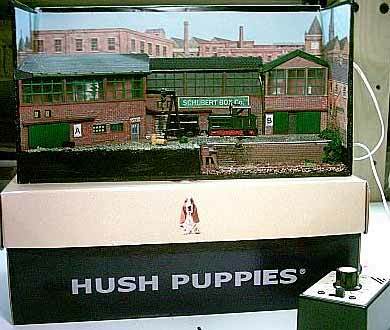 Set in SE London, the plan represents a canal and docks complex served by class A1 (Terrier) locomotives. Says Giles: “Connection to British Rail is via the front RH line, with the rear line leading to a factory. At the other end the front line enters Deptford Dockyard (Royal Navy) while the rear line passes on to another goods yard area, allowing almost any type of wagon to pass through. The LH hidden road is a sector plate allowing trains to reach a short coal siding; the coal merchant’s storage is under the brick arches that form the backdrop.” Lots of action in a very limited space! 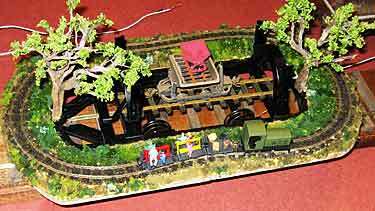 Martin Hogg, from Mansfield, England, was inspired by our previous “Two Turnouts Theme” issue to build Winklington, a 4mm scale light railway halt. A “quickie” project, Winklington uses an existing 48in foam-based layout base and track, scenery and OO stock he already had on hand. Martin remarks, “I don’t want to spend ages or lots of money on this, but it keeps the juices flowing whilst I plan some other projects.” Sounds to me like a good reason to build a micro layout! You can follow Martin’s many projects at his website. 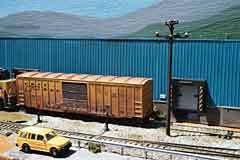 I originally designed this O-scale two-rail shelf switcher as an exercise in planning a micro layout (no more than four square feet or 576 square inches) that could use full-sized O equipment – both a diesel road switcher (like the Weaver RS3) and 50ft boxcars. This layout made use of the Two Turnout Theme to provide lots of switdhing capability in just 544 square inches! Entirely coincidentally, the design turned out to be a mirror image of Giles Barnabe’s little Millwall Quay layout (above) … just stretched out a bit to hold the considerably larger Modern Era O scale rolling stock! Modelers who are not constrained by the “four square foot” rule (which I hope is all of you) might want to extend the rear siding into a factory structure built over the cut-out area that allows this design to be technically a micro. The concealed end of the siding could then be used to introduce rolling stock and remove it from the layout easily and smoothly. Alternatively, that useful area could be converted to a car float, providing another place to switch cars. 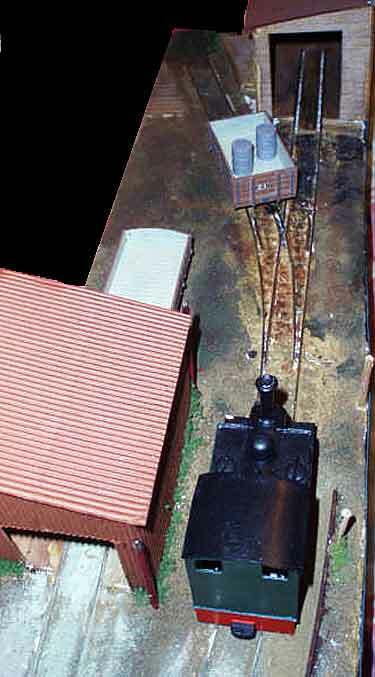 Peter-John Sanders, who lives in Balmer, North Shropshire in England, used a pair of turnouts in a slightly different way on his tiny O-16.5/On30 layout, Balmer Quarry. Because his baseboard, left over from several previous layouts, measures only 30x6in (76x15cm), he arranged the turnouts in line, rather than diverging like the classic version. This layout is one of several independent layouts P-J is building to represent various scenes on his Blackwood Valley Railway, described in Scrapbook #62. The prototype quarry near his home “is on the English side of the Welsh border and was a small pyrites quarry that was served by a 4 chain long branch off the main line.” P-J’s track plan follows the prototype very closely. For more information on the BVR in all its parts, consult P-J’s website. 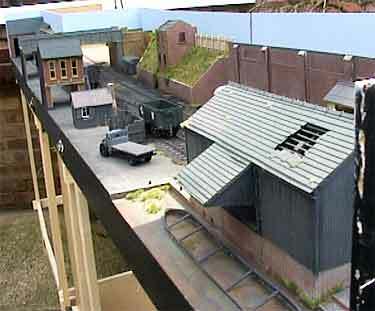 Box Street Yard, designed and built by Jack Trollope, is a modern classic of small layout design. 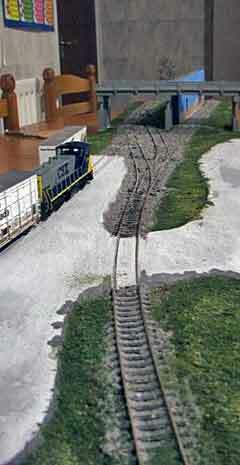 Variations on Jack’s theme abound and are a significant part of the small layout scene worldwide. Here are some recent railroads inspired by this two-turnout classic. Alexander Lösch, from Elfershausen in Bavaria, Germany, is building a U.S. prototype H0 switching shelf based on Box Street Yard (which was designed in Scotland). Modeling a small, urban section of the Delaware & Hudson RR, the layout is built around the Fat City Cycles works — a premier manufacturer of mountain bikes (the red brick building complex taking shape in front of the fiddle yard). Note that Alexander has added a turnout at the front of the layout, to provide an additional place to switch cars. In our limited space, we just have room to show you a few pictures of the fiddle yard, a multi-track sector plate (illustrated below), and a couple shots of the current right-hand end of the layout, showing a marvelous finished factory scene. And there’s much more to come! 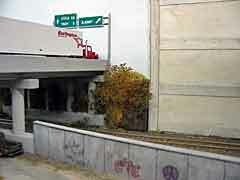 Alexander has many additional photographs and details of the construction at his website. 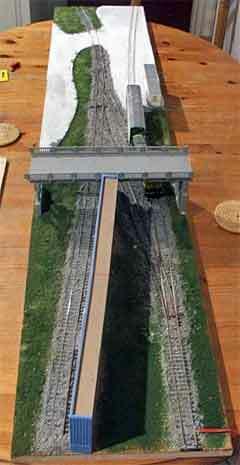 Mike Bragg is building a compact O scale version of the classic Box Street design, called Lenches Bridge, set in the western Black Country of the English Midlands. A plan of this three-part, portable layout appears in Scrapbook #59. 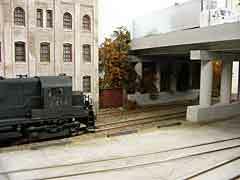 The layout itself will appear at the upcoming model railway exhibition sponsored by the Hagley Rambler Scout Group, on 20 October 2007 at the Hagley Community Centre, Worcestershire, England. The layouts in this exhibition all will have been featured in this Scrapbook! 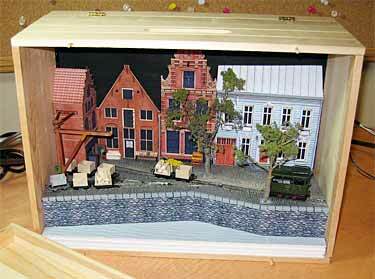 Here are several recent pictures of progress made on the scenic side of this 9×1.5ft layout. For more information about Lenches Bridge, see Mike’s website. 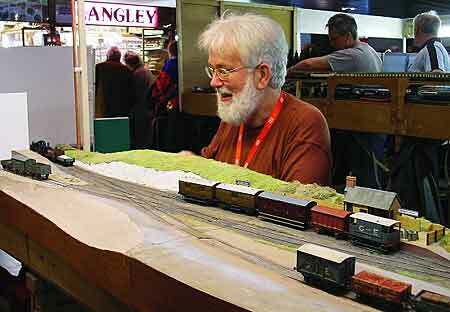 Martin “Mad Marty” Hartley was impressed by an S-scale layout of Maurice Hopper (at right) that he noticed at an exhibition. Martin immediately dashed off a OO scale (4mm to the foot running on 16.5mm gauge) version shown above, Stroudley Green. It’s essentially a Box Street varietal, although Martin didn’t design it that way! He used a small six-inch (15cm) turntable rather than a hidden sector plate, and provided his fiddle track at the end of the long siding. 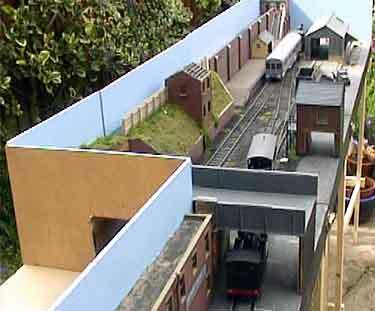 Wistow (above) was a 11½x2½ft (350x75cm) O-scale exhibition layout very much in the same pattern as Box Street Yard. It benefited from the attentions of several successive owners and was exhibited widely during its lifetime. The plan is nearly identical to Box Street, except that Wistow added an extra turnout to complete the passing loop rather than using the sector plate for that purpose. As a result, it was roughly 18in (45cm) longer than it would otherwise have been. 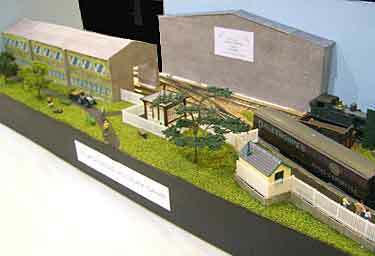 The layout was originally designed and built by Tony Kell of the Normanton and Pontefract R.M.S. as an exercise in “minimum space 0 gauge” (photo above right by Steve Flint). It was set in the Peak District of Derbyshire and named Wistow, a North Eastern station. 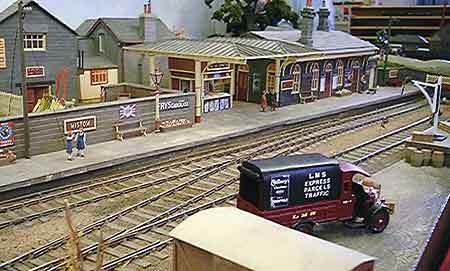 The layout was then bought by Lawrie Smith of the Enfield Town MRC, who added scenic items and rolling stock (photo at right). 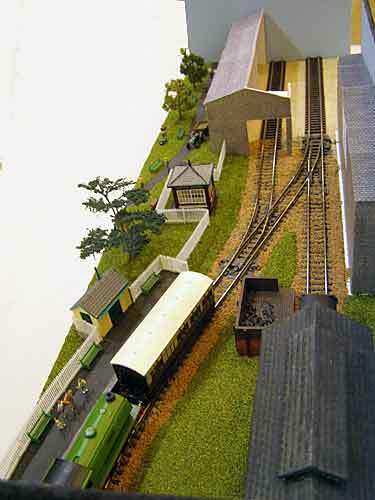 After appearing at many exhibitions, the layout changed owners again, to Keith Plum and Alan Briers of the Enfield Town MRC who exhibited it under the name Oakridge. They retired the layout and dismantled it several years ago. Besides the Box Street Yard variations listed here, quite a number of other versions of this classic design have appeared in these pages, including three by the maestro himself, Jack Trollope! Jack’s designs are Boxer Shortline Amended (Scrapbook #40), Las Cajas Avenue 3 (#42), and Box Street Revisited (#54). Other varietals of Box Street include: Las Cajas Avenue (aka Boxer Shortline) by Jeff Hartmann (#20, #48); Box Straße by Nick Palette (#59); 47th Street Yard by Daniel Schläfli (#22, #42a); Turner Point Yard by Versif (#57); Pine Street Yard by Ken Scott (#33); and New Sarum by John Bruce (the English one) (#48). With over 900 layouts now on the website, I may have missed a few of the Box Street Yard variants in these pages. If you find one that isn’t listed on this page, please let me know so I can add it. Carl Arendt. Thank you for keeping this site going. I belong to a large club of over 100 members. 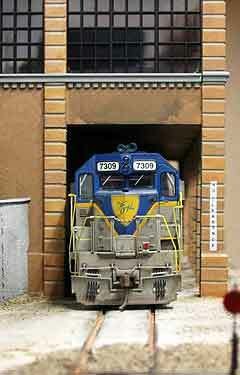 We have our train show on June 26 here in Tallahassee FL..
Certificates’ to the younger operators.